I have a two foot wide 100 foot long space between my and my neighbors cyclone fence and the concrete of my driveway. We had originally used landscape weed blocker, railroad ties and filled in the space with rocks. Well years later the weed block has deteriated and I have more weeds than rock and the ties have shifted due to cold winters and hot summers and the rocks have moved under the ties and are now spilling into my neighbors yard. I would like to replace the rocks (I have elsewhere they can be utilized) but what do I do with the space and a lawn mower is too wide to cut if I laid sod, not to mention the space narrows between my garage and the fence and the mower won't fit. Help.....any suggestions would be welcome and THANK YOU! Have you thought about groundcover? This will crowd out any future weeds and look nice and green too. What kind you use depends on if the area is sunny or shady. Shade is easy...use Pachysandra, Ivy, Vinca, or even Ajuga (although I prefer the other three). If it is sunny, you might consider low, drought tolerant perennials. Thyme and Sedum (the low kinds such as Stonecrop) are good ones. They love the sun and even do well with neglect. Each of them flower also, although the flowers are not real showy. There are many types of Thyme and Sedums and most of them will work. They get to be about 12" wide. You said you have 100 feet in length, so rather than buying 100 (! ), you can space them somewhat and have mulch in the rest of the areas. I would also put down some Preen as a weed preventer. Those weed barriers never really work long term as you have found out. Sedums and Thyme can be a lot of fun. You can mix textures and colors for an interesting design. The shade loving groundcovers are evergreen (Ajuga, it depends) and will spread to cover the areas nicely. You can mix different kinds of those too, such as having an area of one, then another, etc. Even with those though, still add mulch and Preen. Another plant you could use is Liriope...likes part sun and part shade. I have a typical black iron fence with the puppy fence at the bottom. It looks great. However on the other side of the fence is 1.5' earth then parking. I would like to plant something between the fence and parking that will provide privacy, keep cars from parking too close to my fence, is pet friendly, nice too look at, not prone to draught. I don't want a vine on the fence because the fence is pretty. I don't like legustrum (sp?) because the flowers make me sneeze and I don't like gardenia's because the flowers give me head aches. The style of my back garden (4'x6') is English cottage style: simple, clean, romantic. I have a grey flagstone patio out front (5'x5'). Yes my yard is tiny. The yard inside the fence has st augustine grass now. As compared to the photo. I did not receive any photo. If you contact me directly, I will show you where to send it. Also, I need to know where you live so that I know your correct plant zone. We have just had a new fence put in and around the fence is a shallow ditch.. kinda like a swale? We cant really plant grass because it will just wash away and we werent really sure if we wanted to put stone down. We also have neighbor dogs that like to dig under the fence and enter our yard so we are trying to stop that also. If you could give me some suggestions on other ideas that would be great! Thank you. You might consider planting wet site tolerant plants. These plants like wet conditions, so if water is running through the swale, they will do well. The plants will also deter the dogs from entering your yard. Grass works in a swale, but if the dogs are constantly digging there, it probably won't do well. Stone is another option, but that would entail some maintenance...wash out in storms, weeds, etc. I have written a page on rain gardens. The concept of a rain garden is that plants that like it wet are used. They do well and their roots help to absorb the surface water. Here is the page. There are lots of other shrubs and perennials that like wet conditions. 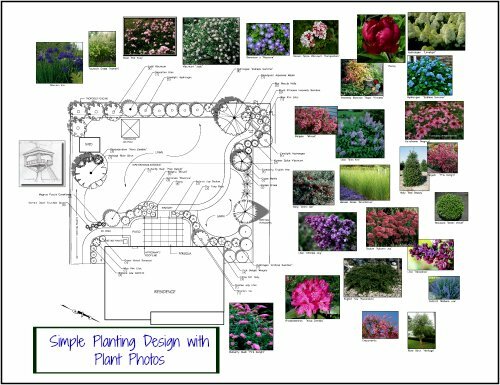 You could create an entire perennial garden, an area of just shrubs, or a mixture of both. I have a ranch style home that has about a 2 acre front yard. I would like to choose an area to fence a front yard so I can concentrate on gardening for a smaller area. Do you have any suggestions as to how I choose a fencing design. I love the cottage look. It depends on if you have any type of animal problem...rabbits, deer, etc. If you don't, and you like the cottage look, picket fencing is nice and very old fashioned looking. You can add some additional interest by choosing a pretty gate and/or an arbor. The fencing does not have to be tall. Two to three feet would work. Gates can either be straight across the top, have a convex curve or a concave curve. If you have deer, you will have to go at least 6 feet tall, seven feet to be sure of protection. Take a look at this site. It is one of my favorites for fencing and the like. Fencing can be white, natural or green, to name a few colors. For a cottage look, I would go with white or green.